When reading the history of gold in Western Australian and in particular the Eastern Goldfields, we hear of rich gold finds, deep mines, so many ounces of gold per ton, lucrative profits, booming towns with numerous hotels, breweries, stock exchanges, newspapers. None of this would have been possible without wood to fuel steam boilers and gas producers for lighting, pumping and ore treatment. Large quantities of firewood were also used by the Goldfields Water Supply pumps to bring the preciously needed water to the goldfields. Timber was also used in construction of buildings and railways and for structural supports in mines. Firewood was brought into the main mining centres via railway lines or woodlines as they became known. Woodcutters lived and worked at the end of these lines, in what could only be described today as the most basic of conditions. The chopped wood was delivered to the rail line by carters using horse and drays, where it was stockpiled for loading onto rail wagons. The important and crucial role the timber cutter played in the gold mining industry can be shown by the 1911 wood cutters strike, when more than 6000 men in the gold mines were to be thrown out of work if the strike did not cease. In the 1944 strike, all the gold mines in Kalgoorlie were to close down when the firewood stock-pile ran out. This book is a collection of newspaper articles and letters to the editor that appeared in newspapers such as The Sun, The West Australian and The Kalgoorlie Miner. The articles and letters by writers such as Crosscut [T.H. Wilson] and reporters for The Sun, give the reader a clear understanding of events at the time, the undercurrents and how high feelings were running on various issues such a strikes, pay, living expenses, dagoes, the company, bosses, life in the bush and so on. The articles are a rich and fertile field of information, and have been assembled into groups and then in chronological order, so particular themes can be followed. 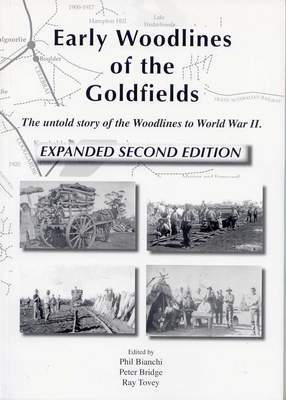 The book is indexed, has over 80 illustrations and is of great goldfields interest.